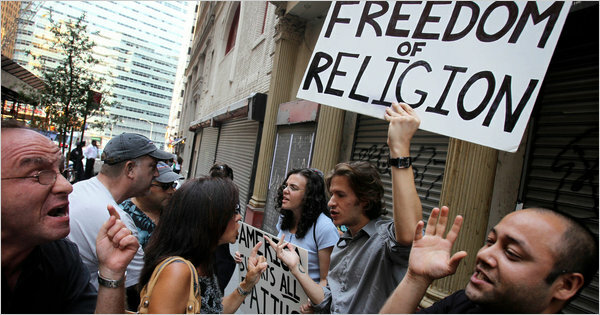 Passers-by confronted Abu Rahman, right, Matt Sky, and Julia Lundy, who demonstrated for religious tolerance at the site of a proposed Islamic center near ground zero in Lower Manhattan. WASHINGTON — Some counterterrorism experts say the anti-Muslim sentiment that has saturated the airwaves and blogs in the debate over plans for an Islamic center near ground zero in Lower Manhattan is playing into the hands of extremists by bolstering their claims that the United States is hostile to Islam. Opposition to the center by prominent politicians and other public figures in the United States has been covered extensively by the news media in Muslim countries. At a time of concern about radicalization of young Muslims in the West, it risks adding new fuel to Al Qaeda’s claim that Islam is under attack by the West and must be defended with violence, some specialists on Islamic militancy say. “I know people in this debate don’t intend it, but there are consequences for these kinds of remarks,” said Brian Fishman, who studies terrorism for the New America Foundation here. He said that Anwar al-Awlaki, an American-born cleric hiding in Yemen who has been linked to several terrorist plots, has been arguing for months in Web speeches and in a new Qaeda magazine that American Muslims face a dark future of ever-worsening discrimination and vilification. “When the rhetoric is so inflammatory that it serves the interests of a jihadi recruiter like Awlaki, politicians need to be called on it,” Mr. Fishman said. “It’s seen as proof of what Awlaki and others have been saying, that the U.S. is hypocritical and that most Americans are enemies of Islam,” Mr. Kohlmann said. He called the anti-Islam statements spawned by the dispute “disturbing and sad” and said they were feeding anti-American sentiment that could provoke violence. While some critics of the Islamic center have carefully limited their objection to its proximity to the site of the Sept. 11 attacks, and have rejected any suggestion that they are anti-Muslim, the issue has tapped into a well of suspicion and hostility to Islam across the country. Many Republican politicians, including Newt Gingrich and Sarah Palin, have said that the proposed location of the center showed insensitivity to the victims of 9/11. Others political leaders, including President Obama, Mayor Michael R. Bloomberg of New York and Gov. Christopher J. Christie of New Jersey, have defended the right of Muslims to build the center or warned against anti-Muslim hysteria. The dispute has tapped strong emotions in the wake of a series of terrorist plots and attacks over the last year aimed at American targets, several of them inspired or encouraged by Mr. Awlaki. The events included the killing of 13 people in November at Fort Hood, Tex., by an Army psychiatrist, Nidal Malik Hasan; the failed attack on a Detroit-bound airliner on Dec. 25 by a young Nigerian man; and the attempted bombing of Times Square in May by Faisal Shahzad, a financial analyst who had worked for a Connecticut cosmetics company. Mr. Awlaki, whose Web diatribes calling for attacks on the United States have turned up repeatedly in terrorism investigations, has sought to counter the notion that American tolerance extends to Muslims. Dalia Mogahed of the Gallup Center for Muslim Studies said the outcry over the proposed center “plays into Awlaki’s arguments and Osama bin Laden’s arguments” by suggesting that Islam has no place in the United States. Mr. Gingrich, the former House speaker and a potential 2012 presidential candidate, said in a Fox News interview that “Nazis don’t have the right to put up a sign next to the Holocaust museum in Washington,” a comment that drew criticism for appearing to equate those proposing the Islamic center with Nazis. Muqtedar Khan, an associate professor of political science at the University of Delaware, said he was not sure the Islamic center dispute alone would radicalize anyone. But he said it was “demoralizing” for Muslims like him who defend the United States as an open and tolerant society.